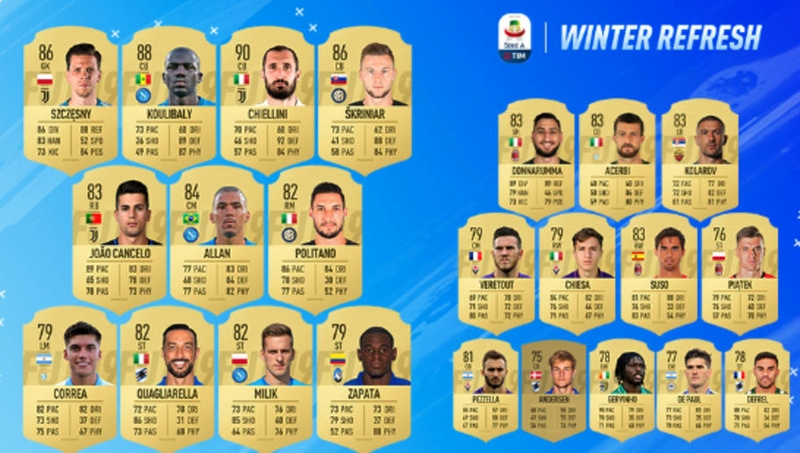 ​EA Sports and FIFA 19 continued their Winter Refresh promo Tuesday with a brand new Serie A ratings refresh. And just like last week's Premier League update, 23 players received an updated rating honoring their play so far during this Serie A season. Krzysztof Piatek might be the biggest standout out of this group as he received a +6 boost to his rating, moving him from a 70 overall silver to a 76 Gold. That is an insane jump, but he deserves it. Piatek has been killing it since his transfer from Genoa to AC Milan at the end of January. He has 17 goals on the season, but in just four games at his new club, the 23-year old has four goals and has given new hope to Milan's frontline. Another player who stands out in this update is Arkaduisz Milik from Napoli, There have been times that Milik has been overlooked by his teammates Lorenzo Insigne and Dries Mertens, but that may have actually helped him. Milik currently has 12 goals in Serie A this season and has given Napoli another weapon up top. During this update, the FIFA team has given a +2 boost to both Milik's shooting and overall. Two other players who got decent boosts during this update were Giorgio Chiellini and Kalidou Koulibaly. Each player received a +1 boost to their overall, but more importantly, they both received that boost on their defending, making them even tougher to beat. These updates have been great so far beginning with the ​Prime ICON Moments and ​Premier League updates, so it seems that FIFA will keep these Winter Refresh updates coming. So make sure to keep looking for those each week.